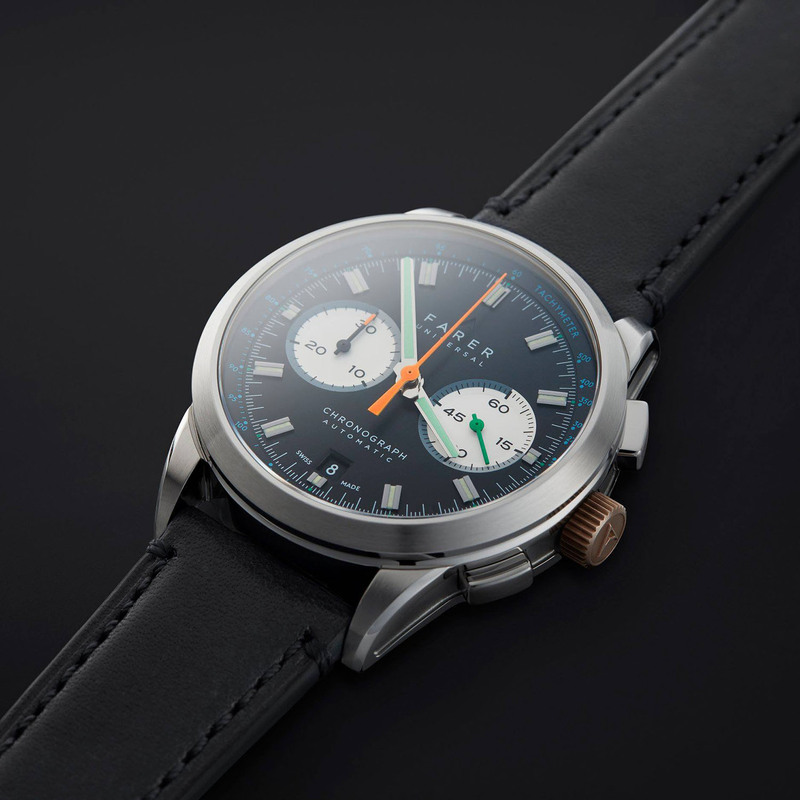 You’d be hard pressed to find a more mature and unique watch company in the world of microbrands than London-based Farer Universal. 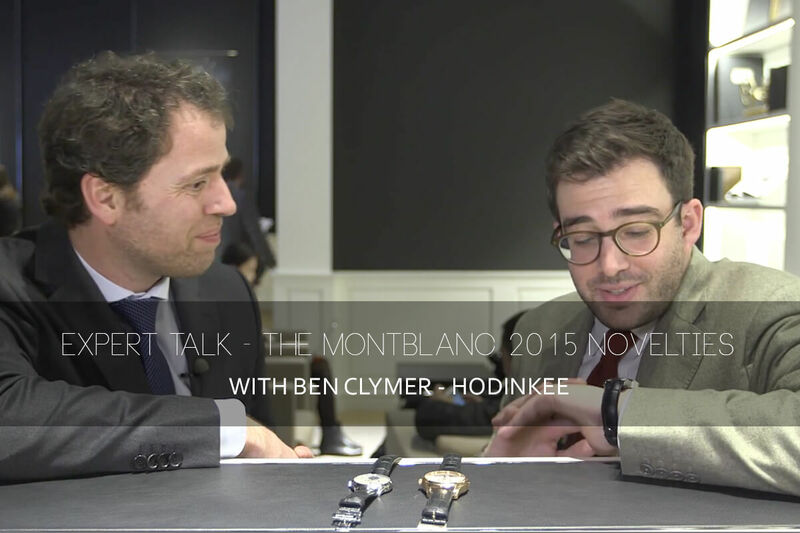 Their production is predictably limited in number for a small brand, offering a maximum of 300 individual watches within most series (many are limited to 100) and they often sell out in a matter of months. They’re known for using a lot of colours and whimsical designs, yet maintain a sophistication and maturity that keep them from resembling expensive Swatch watches. 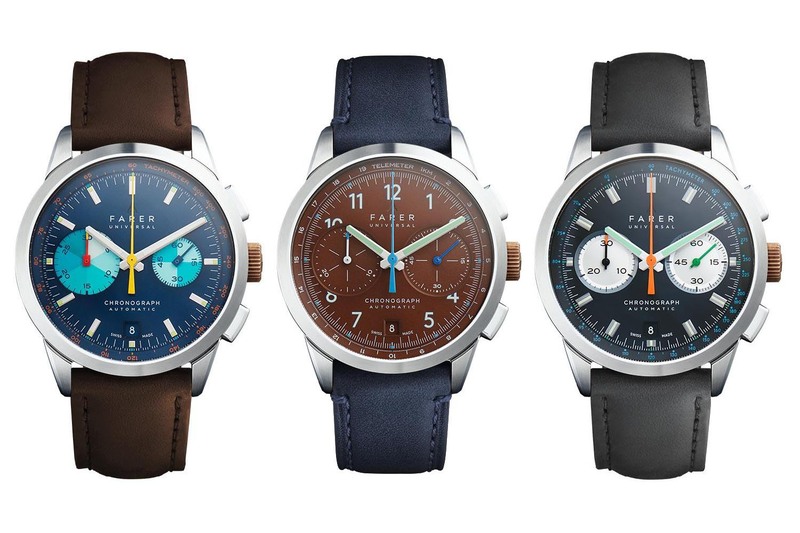 With the exception of their initial quartz line, Farer always releases new watches in a series of three, all having very different dial designs that share a common case. Following up on the 37mm Hand-Wound series released a few months ago, the company just launched three automatic chronographs that continue their distinctive design language – The Cobb, Eldridge and Segrave. 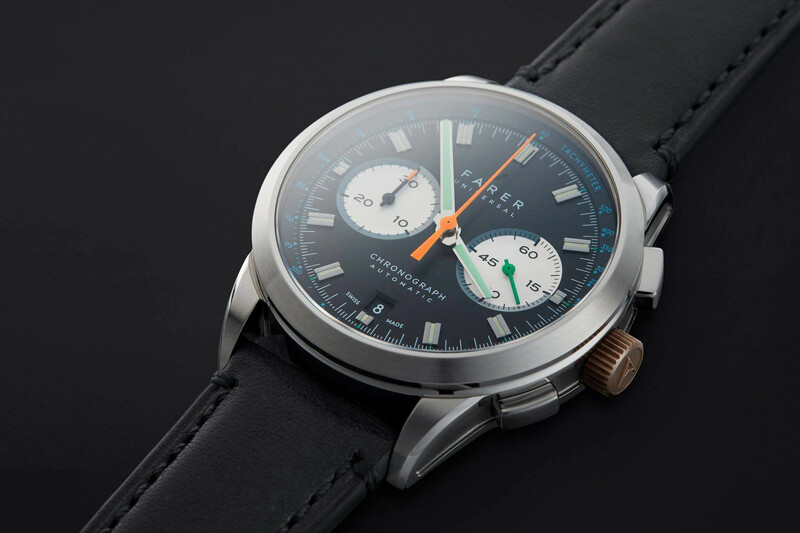 We covered their Three Hand Automatics a couple of years ago and recently reviewed their Aqua Compressor Endeavour, and these new chronographs take things up a notch in both design and sophistication. 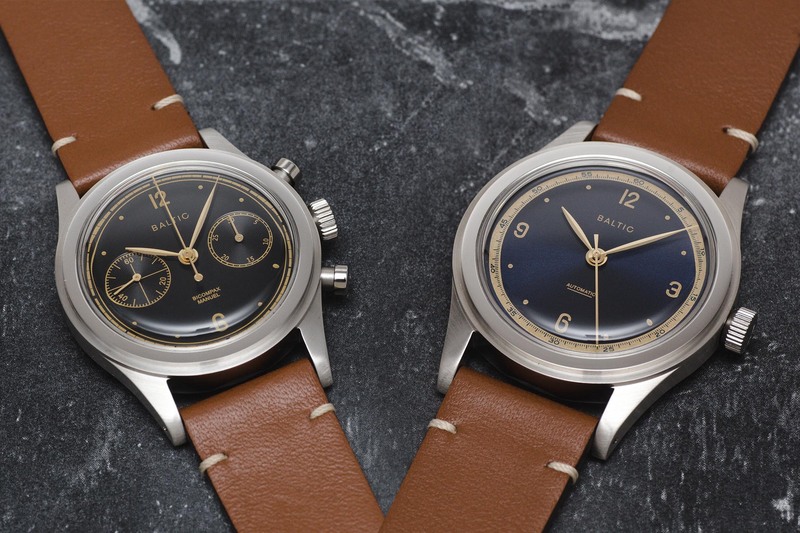 All share a common 39mm stainless steel case that’s 12.5mm in height with Farer’s signature bronze crown (between two oblong pushers in this case). 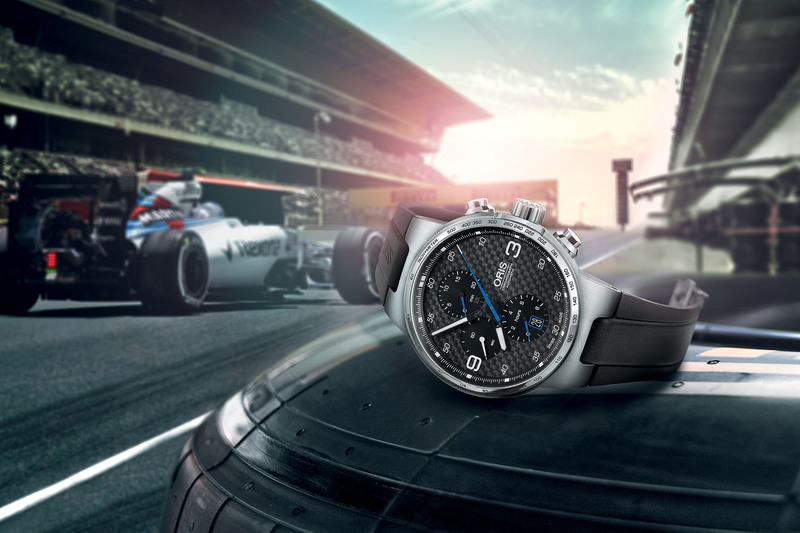 Unlike the cases on the Aqua Compressor models with flat polished sides, the chronographs have recessed micro-blasted sections that stretch to the ends of the lugs. 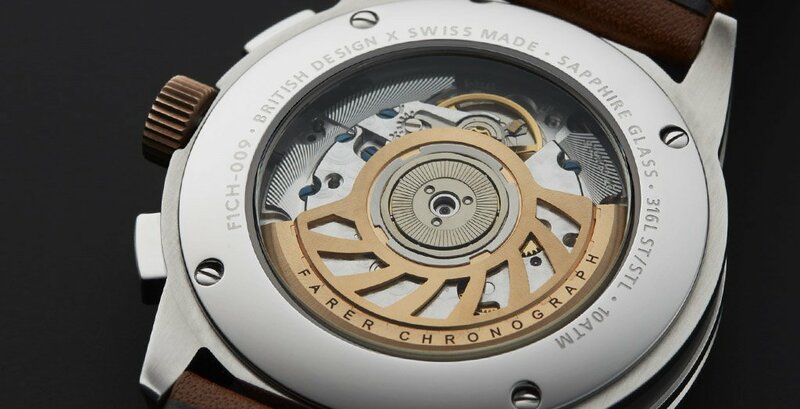 Farer is known for their attention to detail and no part of these cases have been overlooked. A domed sapphire crystal with an anti-reflective coating is surrounded by a heavy, polished bezel on the front, while the backs have a flat sapphire crystal displaying the decorated ETA 2894-2 Elaboré movement. The cases are water resistant to 100m. The first model is the Cobb and it sports a “big eye” chronograph sub-dial like the Longines Avigation BigEye I recently reviewed. This one is at 9 o’clock instead of 3 and has a graduating aqua colour scheme. 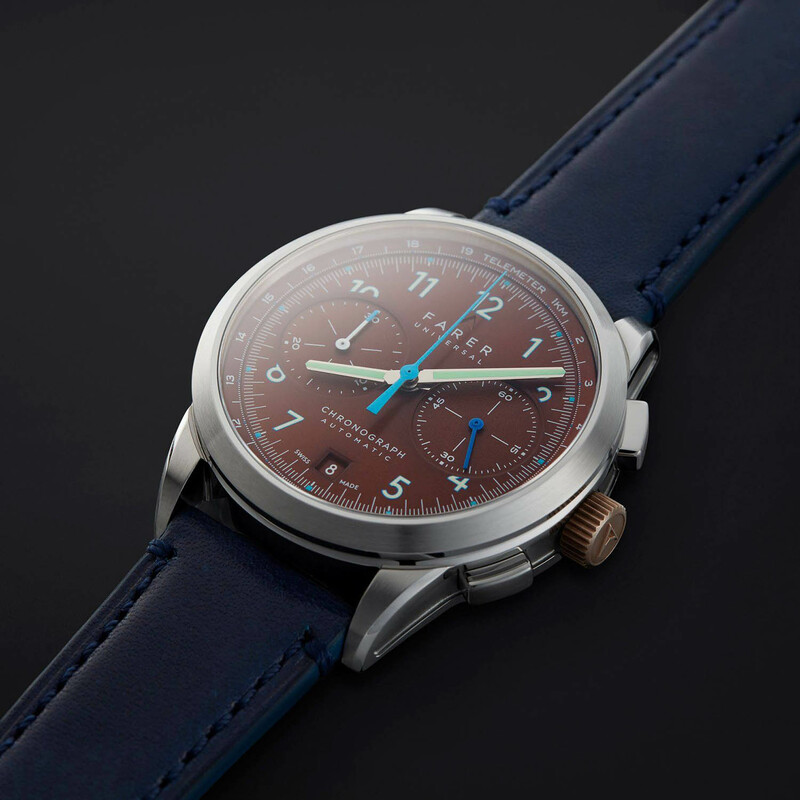 The sub-dial seconds are at 3 o’clock with a similar aqua design and the dial itself is “night-sky” blue. In Farer tradition, the hands are varied in bold colours. The central chronograph hand is yellow with a polished silver hour and minute hands. The “big eye” sub-dial has a red hand with a yellow tip, while the sub-dial seconds hand is blue. A date window sits at 6 o’clock on all three models and matches their respective dial colour, blending in well with the design. Applied indices every five minutes surround the dial with an outermost tachymeter sporting orange print. The hour and minute hands, and tips of the indices have white Super-LumiNova. I find the Cobb to be the most “Farer” and whimsical of the three, but the others are anything but plain. The Eldridge has a deep brown “silk chocolate” dial and matching brown sub-dials, and is a bit more conservative than the Cobb. 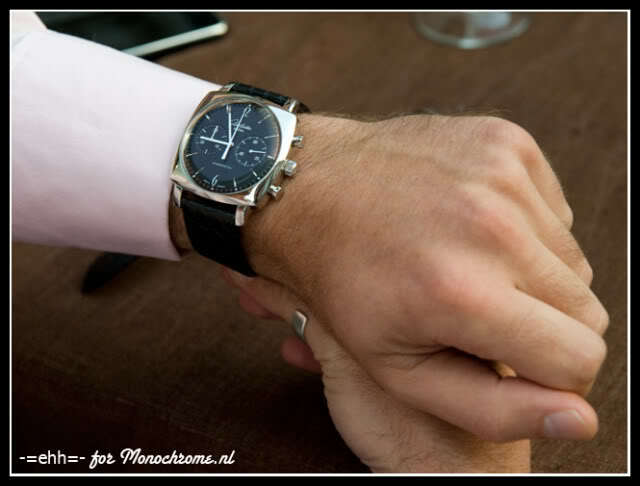 There’s no “big eye” sub-dial this time and the hands are slightly more subdued. The thirty-minute counter at 9 o’clock has a white hand with a blue tip, while the seconds hand at 3 o’clock is blue. The central chronograph hand is a lighter blue and the hour and minute hands are again polished with a mint Super-LumiNova. There are no applied indices, but printed numerals filled with mint Super-LumiNova as well. A white chronograph seconds track has blue dots of Super-LumiNova every five seconds and the outermost tachymeter is also printed in white. It’s definitely a unique piece and the colorful hands really pop in front of the brown dial. The Segrave, in my opinion, is the most reserved of the three. It has a somewhat conventional reversed panda aesthetic with a black dial and white sub-dials. It reminds me a little of the Endeavour, which was also the most reserved in its series, but the Segrave has more personality. The white sub-dials really stand out against the black dial and a graduated light-to-dark grey fills their outer tracks. 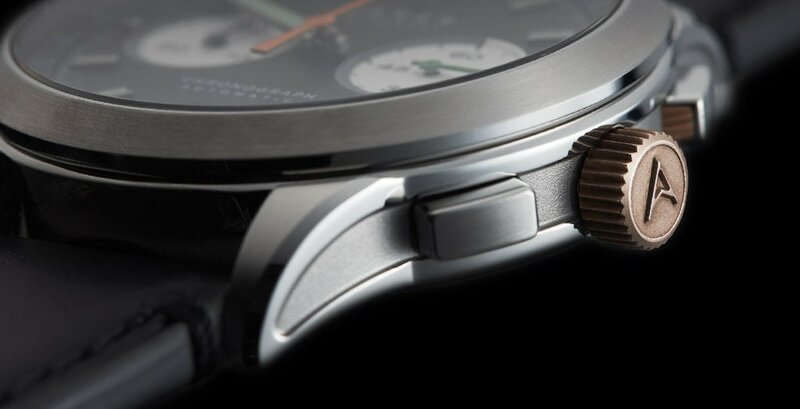 The thirty-minute sub-dial at 9 o’clock has a black hand with an orange tip (were you expecting a white tip? ), while the seconds hand at 3 o’clock is a deep green. The central chronograph hand is orange and as with the other models, the hour and minute hands are polished with a mint Super-LumiNova. Like the Cobb, the Segrave has applied indices every five minutes with lume. The outer tachymeter has printed numerals in blue. This model may be the most conservative of the three, but it’s not your ordinary chronograph and all three models are full of character. The common engine of the series is an automatic ETA 2894-2 Elaboré with a custom, skeletonized bronze rotor. It has 37 jewels, beats at 28,800vph (4Hz) and has a 42-hour power reserve. Functions include hours, minutes, central chronograph seconds, a thirty-minute counter at 9 o’clock, a small seconds at 3 o’clock and a date at 6 o’clock. The movement is decorated with blued screws and perlage on the bridges, and the bronze rotor adds a lot to the aesthetic. All three watches come with an American Horween leather strap with an engraved stainless steel buckle and quick release levers. You can choose black, brown, tan or navy upon checkout and most third-party 20mm straps will fit as well. If you swim with your watch, I’d recommend swapping the leather for silicone or nylon. 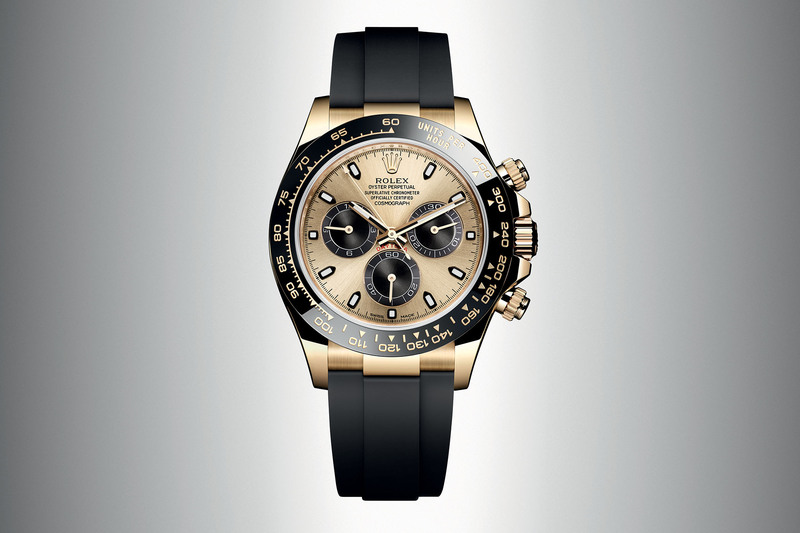 Each of the three watches is limited to 100 pieces with a price of EUR 1,850 or USD 1,950. It’s their most expensive series to date, but still a fair price for what’s being offered. Complimentary engraving is available on the case backs, but it voids the return policy. The new chronographs come with a five-year warranty, 30-day return window and free next-day delivery in the UK, US and many parts of Europe. 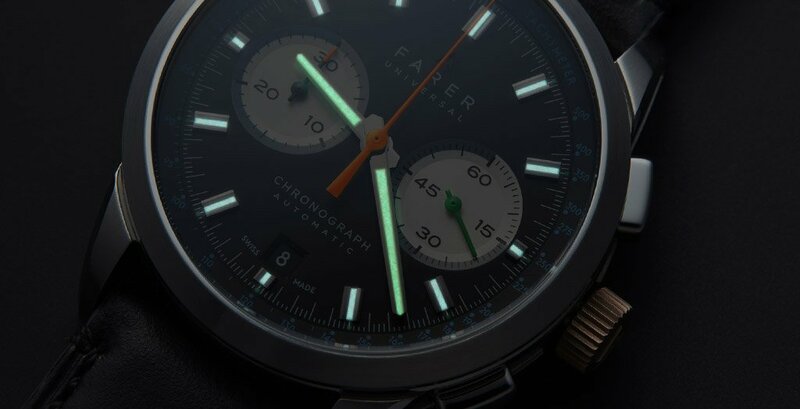 More details on farer.com. Just to clarify .These are 30 minute chronos?